Something that we as musicians all struggle with is finding time to practice our instrument. As modern life gets busier and busier, it’s becoming harder to find the time to devote to our jazz guitar playing. I guess that this article is just as much an article for you as it is for me. It’s kind of like a collection of notes to myself: a reminder of some of the strategies that really work for me when time in the woodshed simply ain’t happening. 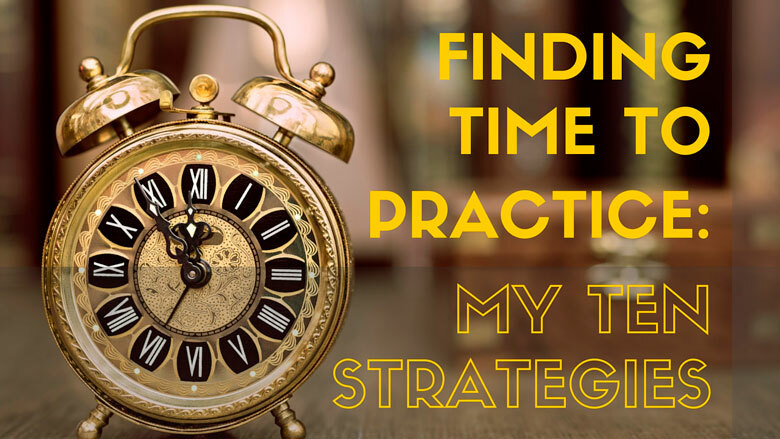 In this post, I’m going to go through 10 strategies and mindset shifts that have worked for me over my career to find the time needed to practice the guitar. I’ll also outline some strategies that you can use to set up a workable practice routine at home. If you’re like most of us, you’ll probably be facing some obstacles getting in the way of time with our guitar. Why do obstacles like this always seem to arise we when we are trying to achieve something really worthwhile – like, for example, becoming an awesome jazz guitarist? If we want to achieve anything good in life, we are going to meet obstacles at some point. It’s important to realize that those frustrations, setbacks, interruptions, and distractions are actually part and parcel of trying to improve yourself or a skill. It is not possible to make progress without them arising in some way. So don’t be disheartened if you’re currently struggling against obstacles that are preventing you from getting to your instrument or making progress. It’s inevitable that you’ll meet obstacles at some point. However, it’s how we navigate and learn from those obstacles that’s most important. Keep this point firmly in mind as you read through the rest of the strategies in this article, which offers various ways on how to deal with the kinds of obstacles listed above. Trust me, we’ve all thought that! However, the above statement is disempowering. You can’t find time to practice. You have to make time to practice. Disempowering thoughts about your perceived lack of time are much more of an obstacle than the situation you are perceiving to be the cause of the problem. Time is a scarce and precious resource, and it slips through our fingers very easily. I’m sorry to tell you this, but it will never happen. You have to make a conscious decision to be strategic and organize your day to allow practice time to happen. Often we think “we don’t have enough time” because we are thinking about our current commitments the wrong way, taking them too seriously, or overestimating them. Having a routine is the core skill of any musician. It’s from a routine that the effort you put into something has the highest leverage. It makes difficult things easy by turning something impossible into manageable chunks. Do a time audit – this is a process whereby you carefully track your activities for two weeks daily, using something like this spreadsheet or just a pen and paper. If you track your time carefully for a while and then look back, I’m sure you’ll find some corners of your day where you can whittle down other activities to make more time for your jazz guitar practice. Be realistic for how much time you can allocate daily to practice. Start small if you are a beginner. If you’re an advanced or professional guitarist, you will need around an hour at least for jazz study. If you are struggling getting started, just start with a small token commitment, even just 10 minutes a day is a start. Like a muscle, the momentum to practice builds up over time. A lot of time can be wasted if you are not organized in advance to practice. Make sure you have a dedicated corner of a room (or a whole room if you house is so endowed) and that all your gadgets and doodads are out ready to go. Your precious 30 minutes may be 90% wasted if you are running around looking for your guitar tuner, a pencil and so on. Use headphones and an electric guitar if you need to practice at a time that will disturb other family members. For those times my practice needs to be quiet I use the Steinberg UR44 audio interface plugged into my computer with headphones. What is great about this setup is that all you need to do is turn your computer on, plug your guitar in and everything is ready to go – perfect for a late night practice session and no complaints from the neighbors! Added bonus: you can easily record yourself through this setup to assess your progress. Making time in your schedule for an artistic pursuit or hobby means that you need to have clear communication with others that it affects. For example, to allow time to practice guitar it might mean you need to get up a little earlier or go to bed slightly later. This sort of thing can cause tension with other family members or housemates unless everyone is on the same page, and will spell certain doom for your practice routine in the long run. So, just have a clear easy-going discussion with those people that your practice time may affect. Come to a clear agreement as to how long a practice session would be workable, and at what time of day would be most suitable. If you don’t have family or other flatmates where this would be an issue, it’s still important to come to a clear decision within yourself as to what would be the best time of day to practice, and for how long. I can’t emphasize this enough – having a regular daily routine is the primary tool to get you the results you want on the guitar. You don’t need as much practice time as you might think to make a lot of progress. When it comes to practicing their instrument, musicians come from a time-honoured tradition of spending extreme hours on their instrument (I’ve heard stories of some jazz players practicing 15 hours a day!). However, this is just based on advice from a succession of teachers, rather than on logic, science or plain old common sense. Even though I’m a professional guitarist, due to my family commitments, appointments with students and running a website, I only have 90 minutes per day to practice. Yet, I’ve been very careful to organize my practice time so that I can cover all the bases and still make satisfying progress. Quality, not quantity, is what counts here. How you practice is much more important than how much. So, study the science of what makes for good music practice. Read books on how to practice well. Get advice from a teacher on what you should be doing as the next step for your playing, how to implement this in your playing. Always ask why you are doing a given study or exercise – does it make sense at this part of your journey? Having oodles of time to practice guitar doesn’t necessarily guarantee you will make oodles more progress. In fact it can make you slack with your time and reverse productivity. It’s important for your progress to have clear limits on your practice time. Daily consistent application is far more important in the long run than how many hours you rack up in a given day. How focused you are is what really matters. A short daily session will still enable you to have great progress. Human beings constantly crave more and more. “I wish I had more of this, I wish I had more of that”. However, having strict limits can fuel your progress more than if you didn’t have those limits. For more on this subject, check out this great article which questions how many hours of practice are actually necessary, even for professional musicians. If you do have limited time to practice, it’s crucial that you don’t allow any distractions at all during the time you’ve allocated. Again, this will have to be negotiated with other household members (if any), who should know that your practice time is only for practice. Unless there is an emergency you cannot be interrupted for any reason. This will enable you to take full advantage of the session and to benefit from the state of ‘flow’ that Dr. Bradberry suggests above. Ignore those Facebook notifications and text messages – they can wait until after your session. In fact, just turn the darn phone off! There is another aspect to distraction that is more subtle, but equally disruptive – inner distractions. You know what I’m talking about: thoughts about some pressing deadline you have at work, the checklist of things to buy at the grocery store or things you need to organize for an upcoming gig. Just like external distractions, inner distractions steal your focus and can make your practice session unproductive. So, develop ways to quieten the inner distractions. Give yourself mental space and permission to work only on your jazz guitar playing before you start each practice session. Meditation could be something to look into if you’re struggling with dealing with inner distractions, check out this page on my website for more details. It’s one thing to make the time to practice jazz guitar, it’s another thing to actually use the time well. At this point, have a think about how you structure your practice session. Get out a piece of paper and write down right now what you’ve been doing lately in the woodshed. Now look carefully – could this be improved? Is each session leading meaningfully to the next? And most importantly, have you established clear objectives for each session? I had a discussion with one of my guitar students I teach online recently who indicated he had, in his own words, spent “a large part of his life memorizing all Drop 2 and Drop 3 inversions, every scale position of melodic minor, and an encyclopedia of arpeggio patterns”. However, if these exercises are not directed into actually making music, i.e. learning tunes or developing technique, this kind of study can waste a lot of precious practice time. Be careful not to whittle away your practice time on endless exercises. When studying jazz guitar, all exercises should be practiced with the intention of applying it to a particular tune or set of changes – they are not an end in themselves. In some upcoming posts that are planned for this blog, we’re going to go into a lot of detail about what makes a good jazz guitar practice session and how to structure it effectively, as well as some great books I can recommend on the subject. In the meantime, have a think about what the real core components are that you need to focus on. That’s what I’m working on at the moment, but your practice routine might be a bit different. Whichever way you structure your session, have a clear plan of attack. That way you will get the most bang for your buck for this most precious commodity that is always running out – your time. For a jazz student, listening to recordings is really important. I listen to a ton of jazz recordings every week, and it’s a great way to absorb the vocabulary of jazz, especially if you’re new to the genre. A cost-effective way to do this is to get an Apple music subscription. For a fixed fee of a few dollars per month, you’re able to listen to any album in their enormous collection. (I use Apple Music over Spotify because I think Apple’s collection for jazz is much better). If you save the album to your favorites, you can listen to it even without an Internet connection. Nearly all the jazz albums that I’m interested in listening to are available on the Apple platform. For example, here’s a recording of a great Wes Montgomery album I’m listening to right now. I use times in the day when I’m not at my instrument to catch up on listening, e.g. doing the dishes or driving my car. You can digest a huge amount of jazz vocabulary just by listening, and it’s also a lot of fun getting to know a particular player’s style. Even if you are short on time when it comes to your actual practice session, this could be a great way to move forward in your jazz study without any more time investment needed. I believe that energy and time are interchangeable commodities. If you are unfit and unhealthy, you simply won’t have enough energy to balance your daily commitments, and your jazz guitar playing will be one of the first things to go by the wayside. Although you might need to spend 30 minutes exercising, I find that it wakes up my brain and I’m able to retain what I’ve learned in my practice session much easier, work out problems much more quickly, and be less stressed overall. Being more efficient and effective in your activities is far better than simply ‘having more time’. I know I’m not a health coach, but common sense dictates that for anyone to maintain a balanced life, they need to exercise, eat and sleep well. if you are not prioritizing these three things then a) problems are bound to happen, and b) your jazz guitar practice routine won’t be sustainable in the long run. Is jazz guitar practice an extra burden to your already overloaded life? I believe that nothing could be further from the truth. On the contrary, wholesome pursuits like jazz guitar actually serve to generate more time in your day. Let me explain why I think this is the case. I find my happiness level increases when I am doing a consistent daily practice. My progress is satisfying and I can hear my playing developing each day. This happiness pervades many other aspects of my life, and seems to make life easier on the whole. you don’t need to spend so much time decompressing from work to cope with life et cetera. Dedicating yourself to a pursuit like jazz guitar playing results in a kind of virtuous cycle. When you are happier, life gets easier, and you’re able to undertake other activities more effortlessly. You’re able to clearly discern things that you need to do in your day, and perhaps those that can be put aside. This, in turn, creates more time for practicing jazz guitar! Being an artistic pursuit, jazz guitar is also extremely good mind training. It works out the creative side of your brain, which in turn helps you find innovative solutions to other problems outside of music, which can result in realizing shortcuts that save a lot of time. Bingo! Another way that jazz guitar can create more time in your day. Manage Your Day-To-Day: Build Your Routine, Find Your Focus & Sharpen Your Creative Mind (book), by Jocelyn K. Glei and the team at 99U.com – An excellent read for great actionable tips to carve out a slice of each day for your creative pursuit. The Top 10 Mistakes Jazz Guitarists Make In Their Practice Session – My 49 page eBook offers many tips for improving how you run your practice session and the key mistakes to avoid – get your copy for FREE by signing up to my newsletter – you can do so via the homepage of this site here. I hope you found this article useful and interesting – let’s get the discussion going. 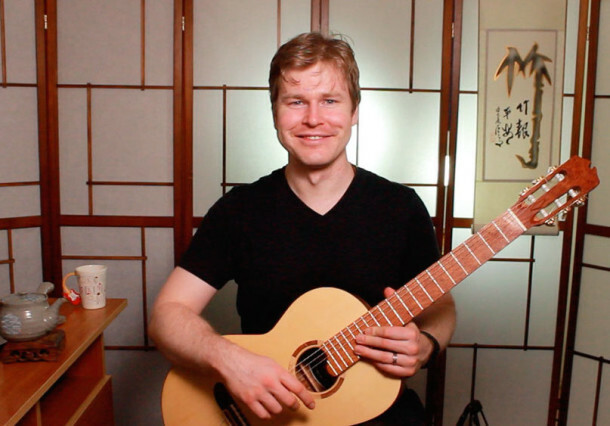 I only put a few ways how to make time in your day for guitar practice, but how about you? Would just like to take a moment to thank you and Matt for all the inspirational material you make available to amateurs like me. Your articles constantly encourage and enlighten. Thanks again. My pleasure Shuggle, great to hear you enjoy the articles! What a great post. I have read many articles and tutors on how to practice. This one has really made me think in many new dimensions. In particular, it’s much less of a “to do list”, and more of a “way of life”. These principles could easily translate into “eating for a healthy life”, “parenting for happy children” and “loving for a great partnership”. On #8 (Practicing “On the Go”: The Art of Listening): yesterday I drove almost 600 km on a business trip. About 200 km from home, I heard a piece on the radio where the vocalist was supported by a repeating, descending, one bar lick. I really liked the lick! It had a strong “call to destination”, with a suggestion of arrival (in one bar). When the song ended, I hurriedly switched off the radio, and repeatedly sung the lick to myself until my voice was hoarse (200 km later). This had the desired effect of implanting the lick into my brain, forever. Yes, there were a few times along the way that I thought I was going mad! That evening, after dinner, I pulled out my guitar and found that I could easily repeat the lick. Two hours later, with a backing track now wearing thin, the lick, the stolen from the radio, suitably morphed, became an adopted child. I know I will love it forever. Also, it was interesting to introduce it to the few other licks, and their morphed varieties, in my family. They adopted each other seamlessly. I am now constantly on the listenout for licks to adopt! On #9: (Stay Healthy and Happy): I noticed a long time ago that half an hour of “anything” in the first few hours of wakening is equivalent two hours of “the same thing” in the evening, after dinner, and a glass of wine! Moreover, television is the most guilty thief of time. And perspective. And creativity. I’m often asked by friends how I find the time to many things that I do (including practice jazz guitar – I can manage an hour and a half a day). My answer is always the same. I don’t watch TV! Finally, to this point #9, it seems like a half an hours casual walk, including good banter, with someone close is a good way to find newness and vigour in one’s subsequent guitar playing. I write a journal of my relation with my guitar, practice and jazz theory..
advise from teachers, fellow adepts will not make the journey easier in terms of time or understanding-the development of practice in daily life must become as necessary as breathing..beyond the struggle into a source of joy-it gives vitality and growth to the art and the artist-as drinking water is necessary to supply every part of the body with life-practice does for the art..